The lawyer for Stormy Daniels, the adult film star suing President Trump and his longtime personal attorney, says he met presidential counselor Kellyanne Conway on Friday night amid festivities in Washington. Michael Avenatti, the lawyer representing Daniels, tweeted that he had a "spirited discussion" with Conway on Friday night amid celebrations for White House Correspondents' Association dinner weekend. 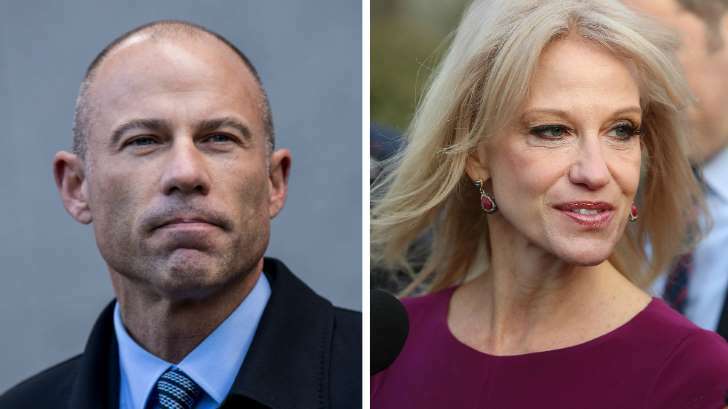 Avenatti did not say where he and Conway talked, though both were in attendance at the WHCD party co-hosted by the United Talent Agency and Mediaite on Friday at Fiola Mare in Washington's Georgetown neighborhood. The party, which drew a mixture of cable news personalities, politicians and Hollywood talent, featured another notable near encounter between former White House communications director Anthony Scaramucci and political reporter Ryan Lizza. Avenatti has maintained a visible presence on cable news recently going after Trump as Daniels sues the president and his longtime personal attorney Michael Cohen. Daniels, whose real name is Stephanie Clifford, is suing Trump to formally void a non-disclosure agreement she signed weeks before the 2016 election. Daniels is also suing Cohen, claiming defamation. Cohen paid Daniels $130,000 as part of the non-disclosure agreement that she says was meant to keep her quiet about an alleged affair with Trump a decade earlier. A judge on Friday granted a request by Cohen to delay the case for 90 days. Trump's lawyer had made the request after invoking his Fifth Amendment right this week, saying he couldn't effectively defend himself in the case because it could incriminate him in a separate federal probe. Avenatti said Friday after the judge's decision that Daniels might file a new claim or lawsuit against the president for libel.